Welcome to Maine Coast Orthodontics! MCO Is Growing! We are thrilled to welcome Dr. Kirk Round to our family! "As an orthodontist there are many options for how and where one will practice their specialty. When the opportunity to practice with Dr. Zanca in Rockport and Belfast arose, I knew it was an opportunity not to be missed. Ed and his team embody a caring, positive, and fun approach to orthodontic care." You always want what’s best for your family: the best schools, the best healthcare, and the best opportunities. At Maine Coast Orthodontics, we want to give you and your family the care and attention you deserve! Dr. Kirk Round has an outstanding reputation for striving always to achieve the best treatment outcome, with close attention to detail. It is our goal at Maine Coast Orthodontics to provide every patient with a positive orthodontic experience that is comfortable, effective, and most of all, fun! Whether you choose Invisalign® or braces, are young or old, we have the experience and technology to best serve you with our friendly and experienced team. Maine Coast Orthodontics prides itself on offering the most current yet conservative orthodontic treatments. We specialize in orthodontics, but also in changing lives! Dr. Round looks forward to working with you, and helping you achieve the beautiful smile you've always wanted. Please contact our Rockport or Belfast orthodontic offices, and discover the difference a beautiful smile makes! Your smile is at the heart of what we do! Comfortable, family-friendly, and fun—our practice has been designed with you and your family in mind! Dr. Round easily relates to young patients, and to creates an orthodontic experience that is educational, beneficial, and most of all, fun! Our practice is dedicated to providing the total patient experience! We want you to be comfortable, happy, and confident with your new smile. MCO specializes in orthodontics, offers braces and retainers, and is a Premium Preferred provider of Invisalign® clear aligners for patients who want to improve their smile without the use of traditional metal braces. We also offer AcceleDent® Aura and PROPEL Orthodontics for faster treatment! 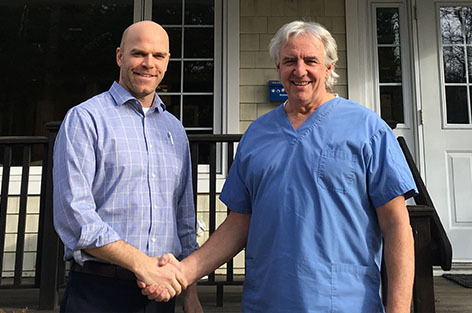 We are commited to serving and providing orthodontic care to the communities of the midcoast Maine region including Rockport, Belfast, Camden, Rockland, Thomaston, Hope, Lincolnville, Appleton, Warren, Waldoboro, Damariscotta, Wiscasset, Bath, Brunswick, Liberty, Waterville, Augusta, Blue Hill, Bucksport, Bar Harbor, Ellsworth, Winterport, and Monroe in Knox, Lincoln, Hancock, Penobscot, and Waldo counties.